If folks have been wondering why I’ve been so quiet lately, it’s because I’ve had my head down and been hard at work on a new side project: launching my new indie game studio, Touchfight Games, with a few good friends. Today, I’m making the news official: I’m diving head-first into the exciting and crazy world of indie game development, and I couldn’t be more excited. What does this mean for my long-time freelance career as a game journalist and my future book projects? What games am I working on? Why am I going indie? Read on, and you’ll find answers to all of these questions and more! Why switch gears and make games? About a decade ago, shortly before I got my first pro writing gig as a newspaper reporter, I stumbled upon this neat little program called Game Maker. Back then, the indie game scene as we know it today wasn’t a thing. This was before digital distribution. Before things really took off for indies in the gaming industry. I remember thinking how cool it would be to release a game, but at the time taking the shareware route and selling a game in plastic ziplock bags at the counter of my local computer store didn’t seem a viable option. I made a few small rough-hewn games that never got played by anybody, and then packed it away as I started working full-time as a news reporter. Fast forward 10 years, and I’ve managed to carve out an awesome career covering games for tons of the print mags and websites I grew up reading as a kid (and many more). I’ve written books, I’ve played in bands and put out CDs, I’ve done a lot of neat stuff. Achievements unlocked. But in the back of my mind, making games — seriously making games — has been a box left unchecked. Until now. As much as I love writing about games, my freelance groove has shifted in recent years. I’ve been doing less straight-up game reviews and traditional games press coverage and more specialty word-slinging that relates to games and tech in other ways. It’s easy to get burnt out churning out dozens of game reviews a month, so shifting focus to other kinds of freelance gigs has been a welcome change of pace for me. I was starting to feel fried…like some of the excitement, the magic surrounding games that drew me into this field in the first place had fizzled. Thankfully, I’ve slain the golem and found my Flamethrower +4 vs Waning Enthusiasm. 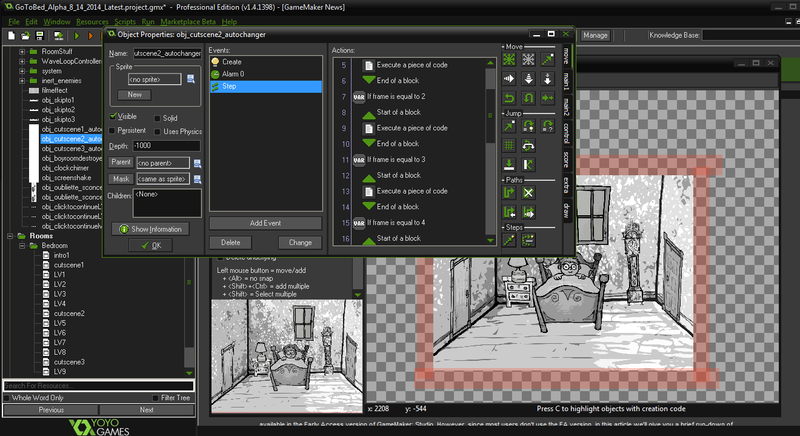 It’s called Game Maker: Studio. Since moving back to Vermont a few years ago, I’ve made some really cool friends and discovered quite a few geeky kindred spirits in my local area. I’ve known my fellow studio cohorts Len and his brother Jon for a while now, and we’ve had sporadic nerd-outs about games and related projects over the past few years. Len is a writer and a skilled artist. Jon, as it turns out, is probably as much of a gaming nerd as I am, and he’s really quite good at pixel art and wrangling code. I noticed a while back that he was making small game projects on his own in Game Maker. It set my mind gears turning. Jon also works at our local mom-and-pop style game store. This summer I was hunting through the rack of NES cartridges at the store and our sporadic chatter about games hit a crescendo. In the same day, I had separate conversations about game making stuff with Jon and Len, and we decided to sit down, tinker around, and see what we could come up with. Within a week we had a rough prototype for a cool puzzle-combat wizard game. Within three weeks we had over a third of the game roughed out and a playable Alpha. Then the game ideas kept pouring out, and we rapid prototyped a half dozen other game concepts. This was happening. So we hunkered down and focused on getting a smaller project ready to launch for in time for Halloween while also chipping away at a few other bigger-picture things for the future. Today, we’re officially launching Touchfight Games and announcing our first project, Go To Bed, which will be out this fall on iOS. We’re developing other projects on PC/Mac too, and we hope to soon branch out into the major consoles as well. Our studio tagline is “quirky games for quirky people,” though the subtext could just as easily read “by quirky people,” which will make a lot of sense if you happen to know any of us. Whether it’s oddball game mechanics, outright strangeness, or stark visual styles, I think you can expect quite a bit of fun weirdness from us in gaming form in the months and years to come. We’re dubbing it a “bedroom defense” game, but Go To Bed is a perfect example of the kind of quirkiness we’re injecting into our projects. It blends Len’s distinct hand-drawn art style (in black and white no less) a children’s storybook-esque world with eerie horror and casual tap-centric elements. This is a game about evil. Evil that wants to touch you. You have to touch it first…if you want to survive the night. In Go To Bed, you’re a young lad who’s been begrudingly sent to his room by his cranky mum. As if having to go to sleep when you’d rather be playing isn’t bad enough, the nightmarish creatures lurking just beyond the flicker of the light are getting hungrier by the minute. On a basic level, you have to tap, flick, and swipe to defend yourself from the encroaching hordes that are slithering towards you from the darkness. Things start of simple enough, but over time your adversaries increase in number, speed, and form, while the game world itself also shifts from level to level. It’s a creepy little game that also isn’t afraid to throw humor and goofiness into the mix. We’ve added in a number of light-based powerups and are implementing a collection system and unlockable goodies. Ideally, we hope to have the game out on iOS by Halloween, but that’ll largely depend on what we add in the coming weeks and how long Apple takes to approve the final build. We also have plans for some cool post-release updates and additional play modes. Much of the core concept for this game came from Len’s art style and storytelling. He kicked me a bunch of art assets he whipped up one day, and I sat down over the course of a few days getting a prototype a rough build together. I did much of the coding and asset importing for the first build, and Jon is now hard at work fleshing out additional mechanics. It’s a very collaborative process, which is cool. We each have our strengths and areas of skill focus, development-wise, but we also each wear different hats throughout the dev process. All three of us are musicians, we’re all artists of some sort (pixel or hand-drawn), and we’re all funneling ideas into each of our games. Good times! Len also did most of the narrative voice work, and he came up with the old-timey piano tunes you’ll hear in the game’s soundtrack. I did a bit of voice work too…I’m both the Mum and the eerie whispers from the shadow world. We’re really excited to see what people think, both of the trailer and of the finished game! You can follow us on Twitter here, Like our Facebook page here, join our “Awesome List” here, and keep tabs on our website and dev blog here. So, yay! Making games! Whee! But how will this impact my writing world? I don’t expect much will change. I’m still working on a half-dozen book projects, the next of which is Volume 1 of my personal essay series Coffee Is My Religion, which focuses on the writing life and games journalism. I expect it may eventually branch off into game development tales too. I’ll have other upcoming books in The Game Journo Guides Series. I’m still freelancing full-time and will continue doing so (both in and outside of the games industry), and my Podcast (The Freelance Game) and other projects will continues as planned. You can still hit me up with game journo related Qs and that sort of thing. What will inevitably change is my role in the games press, what I can cover, and how I’ll cover it. That’s been changing to an extent regardless, as I’ve been exploring other related freelance gigs and whatnot. However it spins out, I want to be transparent and up-front about my new dual role as both freelancer in the games industry and now part-time indie dev. It’s a weird set of hats to be alternating between, admittedly, but I’m hopeful folks in the industry will be supportive of the move. Time will tell! Alrighty, I’m off to hunker down and get to work! You’ll be hearing from me, and us, real soon!